Special page allowing users with the appropriate permissions to view and hide revisions. Log items can also be hidden. Definition at line 30 of file SpecialRevisionDelete.php. Definition at line 108 of file SpecialRevisionDelete.php. Definition at line 489 of file SpecialRevisionDelete.php. Definition at line 508 of file SpecialRevisionDelete.php. References $html, $line, $name, as, Xml\checkLabel(), Revision\DELETED_RESTRICTED, RevisionDeleter\extractBitfield(), extractBitParams(), getList(), SpecialPage\getRequest(), list, SpecialPage\msg(), Xml\radio(), Xml\tags(), and text. Definition at line 112 of file SpecialRevisionDelete.php. Definition at line 116 of file SpecialRevisionDelete.php. References $output, $request, $typeName, $user, SpecialPage\checkPermissions(), SpecialPage\checkReadOnly(), Revision\DELETED_COMMENT, Revision\DELETED_RESTRICTED, Revision\DELETED_USER, RevisionDeleter\getCanonicalTypeName(), getList(), getLogQueryCond(), SpecialPage\getOutput(), SpecialPage\getRequest(), RevisionDeleter\getRestriction(), RevisionDeleter\getRevdelConstant(), SpecialPage\getUser(), Title\newFromText(), null, SpecialPage\outputHeader(), SpecialPage\setHeaders(), showConvenienceLinks(), showForm(), LogEventsList\showLogExtract(), submit(), RevisionDeleter\suggestTarget(), tryShowFile(), and SpecialPage\useTransactionalTimeLimit(). Put together an array that contains -1, 0, or the *_deleted const for each bit. Definition at line 653 of file SpecialRevisionDelete.php. References $name, as, Revision\DELETED_RESTRICTED, SpecialPage\getRequest(), and list. Referenced by buildCheckBoxes(), and submit(). Report that the submit operation failed. Definition at line 638 of file SpecialRevisionDelete.php. 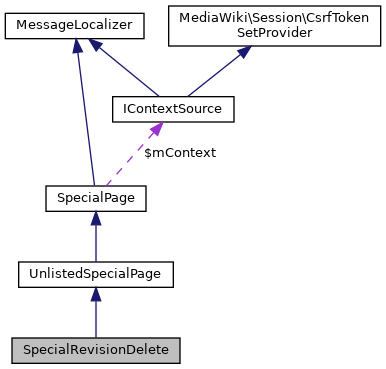 References SpecialPage\getOutput(), SpecialPage\msg(), and showForm(). Definition at line 682 of file SpecialRevisionDelete.php. Get the list object for this request. Definition at line 363 of file SpecialRevisionDelete.php. References $revDelList, RevisionDeleter\createList(), and SpecialPage\getContext(). Referenced by buildCheckBoxes(), execute(), getLogQueryCond(), save(), and showForm(). Get the condition used for fetching log snippets. Definition at line 285 of file SpecialRevisionDelete.php. References $ids, getList(), and RevisionDeleter\getRelationType(). Definition at line 676 of file SpecialRevisionDelete.php. Show some useful links in the subtitle. Definition at line 243 of file SpecialRevisionDelete.php. 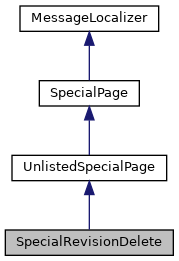 References SpecialPage\$linkRenderer, SpecialPage\getLanguage(), SpecialPage\getLinkRenderer(), SpecialPage\getOutput(), SpecialPage\getSkin(), SpecialPage\getTitleFor(), SpecialPage\getUser(), SpecialPage\msg(), and text. Show a list of items that we will operate on, and show a form with checkboxes which will allow the user to choose new visibility settings. Definition at line 377 of file SpecialRevisionDelete.php. References $link, $out, SpecialPage\addHelpLink(), addUsageText(), buildCheckBoxes(), Xml\closeElement(), CommentStore\COMMENT_CHARACTER_LIMIT, Xml\fieldset(), SpecialPage\getLanguage(), SpecialPage\getLinkRenderer(), getList(), SpecialPage\getOutput(), SpecialPage\getPageTitle(), SpecialPage\getRequest(), SpecialPage\getTitle(), SpecialPage\getUser(), Html\hidden(), Xml\input(), Xml\label(), Xml\listDropDown(), SpecialPage\msg(), Xml\openElement(), Xml\submitButton(), Xml\tags(), and text. Referenced by execute(), failure(), and success(). UI entry point for form submission. Definition at line 580 of file SpecialRevisionDelete.php. References $otherReason, Revision\DELETED_RESTRICTED, extractBitParams(), failure(), SpecialPage\getOutput(), SpecialPage\getRequest(), SpecialPage\getUser(), SpecialPage\msg(), save(), and success(). Report that the submit operation succeeded. Definition at line 622 of file SpecialRevisionDelete.php. Show a deleted file version requested by the visitor. Mostly copied from Special:Undelete. Refactor. Definition at line 303 of file SpecialRevisionDelete.php. References $archiveName, $lang, $path, $user, File\DELETED_FILE, File\DELETED_RESTRICTED, SpecialPage\getLanguage(), SpecialPage\getOutput(), SpecialPage\getPageTitle(), SpecialPage\getRequest(), SpecialPage\getUser(), SpecialPage\msg(), Xml\openElement(), RepoGroup\singleton(), Xml\submitButton(), and text. Archive name, for reviewing deleted files. Definition at line 41 of file SpecialRevisionDelete.php. Definition at line 53 of file SpecialRevisionDelete.php. Definition at line 38 of file SpecialRevisionDelete.php. Whether user is allowed to perform the action. Definition at line 62 of file SpecialRevisionDelete.php. Definition at line 65 of file SpecialRevisionDelete.php. RevDelList object, storing the list of items to be deleted/undeleted. Definition at line 59 of file SpecialRevisionDelete.php. True if the submit button was clicked, and the form was posted. Definition at line 35 of file SpecialRevisionDelete.php. Title object for target parameter. Definition at line 47 of file SpecialRevisionDelete.php. Edit token for securing image views against XSS. Definition at line 44 of file SpecialRevisionDelete.php. UI Labels about the current type. Definition at line 56 of file SpecialRevisionDelete.php. Deletion type, may be revision, archive, oldimage, filearchive, logging. Definition at line 50 of file SpecialRevisionDelete.php. UI labels for each type. Definition at line 70 of file SpecialRevisionDelete.php. Was the DB modified in this request. Definition at line 32 of file SpecialRevisionDelete.php.